This intensive, competency based course provides practical training in precision teaching and programme writing. Participants are supervised in the implementation of skills teaching programmes with children or adults who have learning and communication difficulties, and particular emphasis is given to learners who have severe or profound learning disabilities. On completion of the course, participants will be equipped to devise and implement effective skills teaching programmes, and to ensure a greater intensity of relevant skills teaching in the service within which they work. The course involves 3 x half-day modules of lectures and supervision along with practical assignments (18 hours) over a ten-week period. Each participant will implement a minimum of two skills teaching programmes with three different people. Supervision is based on a review of written documentation and video recording of actual skills teaching procedures. To implement an organisational system for ensuring intensive skills development within the service. Review and feedback on the skills teaching procedures implemented as course assignments. 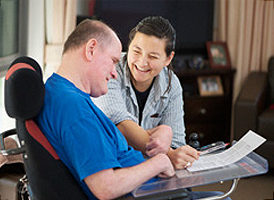 This course is suitable for frontline and resource staff who work with people with intellectual disability. Supervision and feedback is provided throughout training. Venue: Tessa House, Block D, Gleann Na H-eorna, Tallaght, Dublin 24.